James Scheider, Emily Kratter, Michael Sheehy, Stephanie Lynne Mason, Justin McEllroy, Shira Averbuch, Lynn Mancinelli and Katie Rose Summerfield in Evening – 1910. Photo by Pavel Antonov. BOTTOM LINE: Evening – 1910 is musically and visually a stunner, but its convoluted story and repetition hurt the mood. So tells the tale of Evening – 1910, a new musical by Randy Sharp (Last Man Club, East 10th Street) and Paul Carbonara (guitarist and longtime member of rock band Blondie), and a foreword/expansion of 2014’s Solitary Light. Making its world premiere at Axis Theatre, Evening –1910 tells the story of Henry (Michael Sheehy), an Irish immigrant, who arrives on Ellis Island at the turn of a new era for motion pictures and entertainment. Kinetoscopes are beginning to replace the city’s vaudeville shows and one theatre in particular, owned by George Spencer (James Scheider) and stage-managed by Frank (Justin McEllroy), is beginning to feel the heat worst of all. There, Spencer is looking to become the next big name in motion pictures and finds what he needs in Henry, not just as the man who will move his ambitions forward but as mate for his socialite sister Evelyn (Emily Kratter). 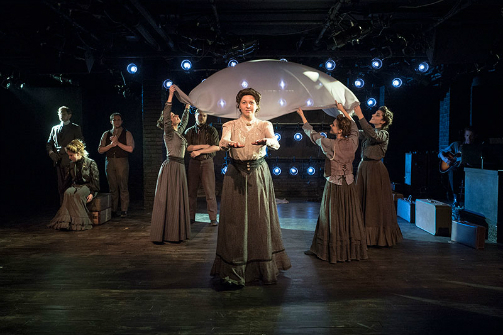 Meanwhile, the theatre’s showgirls (Shira Averbuch, Lynn Mancinelli, Stephanie Lynne Mason and Katie Rose Summerfield) all dream of a better life working in the nearby garment factory, driven by their dignities and destinies. Evening – 1910 is a lot to take in. My initial reaction was “pretty and pretty boring,” having been taken in by the music and design but was ultimately left disappointed by a convoluted story. But this show is not one you easily see without letting your thoughts and feelings simmer—whether or not they’re as mixed as mine. It’s a great credit that its team has made me think more about the show since leaving the theatre. Sharp and Carbonara have put together a truly beautiful and poetic score, one of the best currently in the city even—reflective of not only the frenetic energy of the NYC and its new, hopeful arrivals, but also the tumultuous nature of the shift to moving pictures and the coming of a new age of entertainment. Songs like “Where Is That Map I Made?,” “The Girls Behind The First In Line,” and “Maybe, Maybe Not” perfectly evoke the feelings of hunger and uncertainty in the story. Coupled with both sound effects and off-stage actors to provide the right atmosphere depending on the locale, the four-piece band lead by Carbonara on guitar sets the right mood for the scene every time. That said, with 39 consecutive songs all channeling the same early 1900s folk, it unfortunately suffers from same-melody syndrome. Even without its multiple reprises, there is much repetition in the show’s short length, causing certain moments to lose their potency when you’ve come to the realization you’ve been down this road before. It doesn’t do itself any justice to be billed as a musical, at least not in its current incarnation. Sharp and Carbonara have piggybacked off of their previous musical Solitary Light to create a larger array of songs and a more complete story, but it’s still best coined as a song cycle, or, at worst, a future concept album. It’s simply my hope to hear this music again, even if that means losing the visuals, because it’s impossible not to want to go through it frequently and more thoroughly. The visuals are beautiful more often than not. The audience sees most of the show through golden light, sepia, like you’re watching this moment in time exactly how it is and how it should be. Walls of bulbs burning out, fireflies in the dark, and kinetoscopes in motion, are triumphs from lighting designer David Zeffren. Choreographed by Mancinelli, the movement of the actors is fluid and constant, mirroring the motion of the city and the mechanisms of the moving picture machines. There is always something happening in the foreground and background, captivating until it isn’t—until it exhausts and the continuous motion reaches a point where it feels like nothing more than organized wandering, distracting from a compilation of storylines that require your full attention. It’s a perfect fit for the structure of the story, which is where Evening – 1910 loses itself. In tracking Henry and Louise, along with Evelyn and George, the stories of Frank and the showgirls get left behind and never fully realized. Even though their scenes are plentiful, they begin to feel like nothing more than commercial breaks in the non-stop music and motion because there is nothing descript about their characters or their lives. But with the sheer number of songs, characters, and venues in this brief moment in time, it’s convoluted to the point where you start to lose track of storylines and what you do have a grasp on starts to drag. The incredible group of performers all who shine brightly individually but never as an ensemble. Particularly impressive in the cast are Shira Averbuch, a perfectly cast, calming presence in the show’s calamity, and James Scheider, whose cunning portrayal of George should inspire more writers to pen antagonistic tenors. Evening - 1910 is mesmerizing—hypnotic even—but it walks a very fine line. It is almost too pretty, too controlled and planned, if ever possible for a staged performance. As a result, the 75 minute run time feels simultaneously too short to tell the full story and somehow too long and tiring to inspire you to return to it to understand it better. It’s with a lot of hope that others will, though. It’s simply just a light that could and should burn a little brighter. Evening - 1910 is by Randy Sharp and Paul Carbonara. Directed by Randy Sharp. Dramaturgy by Marc Palmieri. Lighting design is by David Zeffren. Sound Design is by Steve Fontaine. Costume Design is by Karl Ruckdeschel. Set Design is by Chad Yarborough. Choreography by Lynn Mancinelli. Stage Manager is Edward Terhune. The cast is Michael Sheehy, James Scheider, Justin McEllroy, Shira Averbuch, Lynn Mancinelli, Stephanie Lynne Mason, Katie Rose Summerfield and Emily Kratter.